What is a Community Cloud? There are many various combinations of cloud solutions available in the market today. Public, Private, Hybrid and Community Cloud Infrastructure solutions are available through OCcloud9. What exactly is the purpose of each cloud service? What is a community cloud? 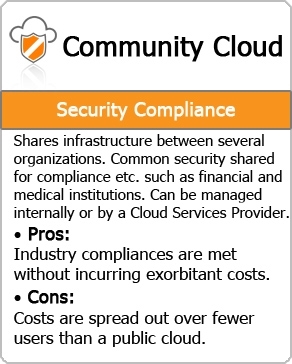 A Community cloud is a cloud solution which shares infrastructure between several organizations from a specific community with common IT compliance guidelines such as data security, data storage location, level of data center clearance and data content. A community cloud solution can be managed either internally or externally by a third-party and hosted internally or externally as well. The costs are spread over fewer users than a public cloud (but more than a private cloud), so only some of the cost savings potential of cloud computing are realized.